How to get there: The city of Tucson, Arizona is a good point of departure. Get on the interstate I-10, direction east and drive approximately 62 miles to exit number 318, exit here and start to measure. You are now on a short-cut road across to Hwy. 191. First, pass through Dragoon, then continue to Hwy. 191, you will see some indistry (large chimmney) on your left. Arrive at Hwy. 191 at mile 13.0, make a right turn here. At mile 30.5, you arrive at the intersection with Hwy. 181, make a left turn here onto Hwy. 181. At mile 42.8, Hwy. 181 makes a sharp left, while your route continues straight ahead, this is a good dirt road suitable for ordinary cars. This road is called Turkey Creek Road. At mile 49.1, there is a dip in the road that may be flooded, check before crossing. At mile 51.2, you cross a cattle guard and enter the Coronado National Forest. Finally, at mile 52.8, you pass a campground and at mile 53.7, the road ends. We parked off the road just below the turn-around, there may be a few more possibilities. 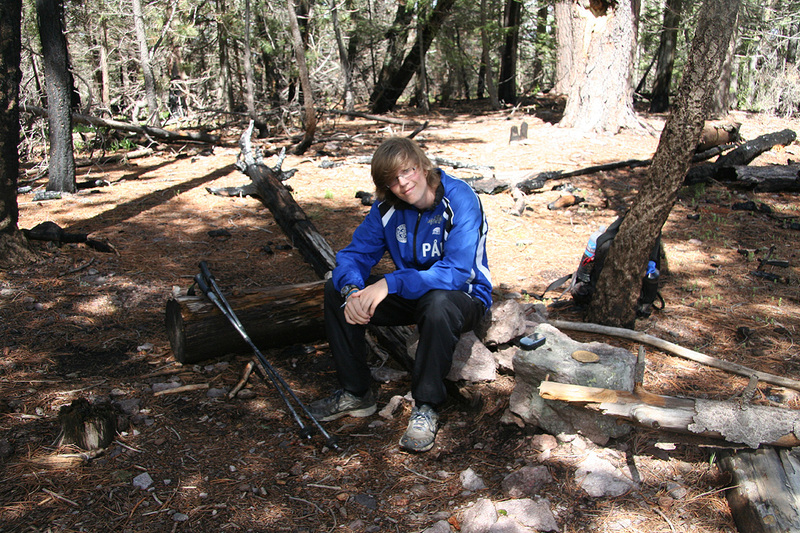 This is the trailhead, location N31:51.005, W109:19.538, elevation about 2050 meter. Route description: Note, there are several routes. At least one route starts quite a bit further down the road at Mormon Creek Trailhead and runs by Mormon Spring. However, we describe a (nice) route that starts at a trailhead by the very end of the Turkey Creek Road. Start out from the trailhead up the canyon along the only good trail. This trail starts out on the right side of the small creek, but soon changes over to the left side. It climbs in zig-zags to a col on the main crest, location N31:49.860, W109:19.641, elevation about 2596 meter. 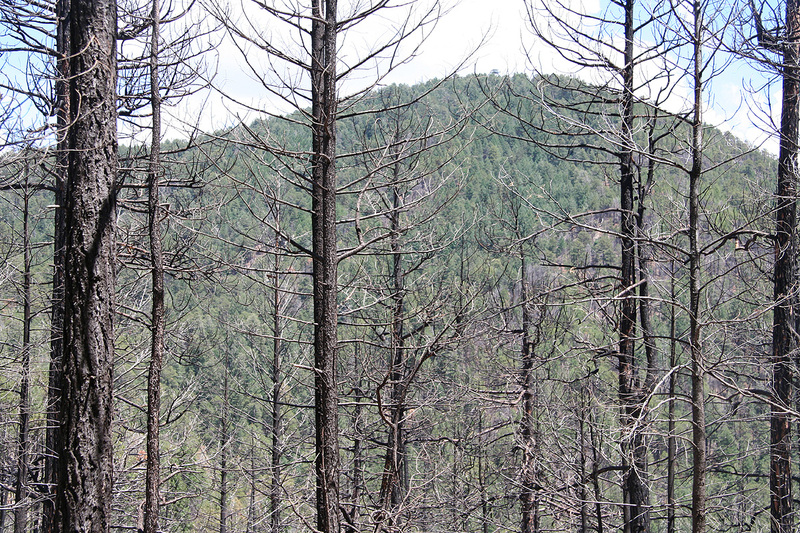 From here, the mountain called Monte Vista (elevation 2857 m, prominence about 61 meter) is clearly visible, one may see the forest fire lookout tower on its top. Take the trail going left, this trail will follow the crest, then climb part of the slopes of Monte Vista. 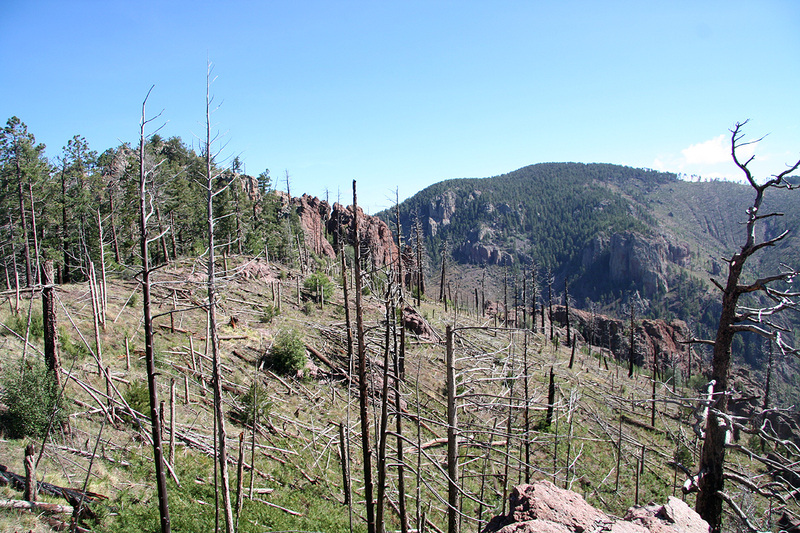 You will find a new trail fork where there is a sign pointing left for Chiricahua Peak. One can also visit the top of Monte Vista along a very short uphill trail from here. The trail to Chiricahua Peak first traverses below Raspberry Peak (elevation 2866 m), this peak is independent (prominence exceeding 100 meter) and an easy climb from the trail. 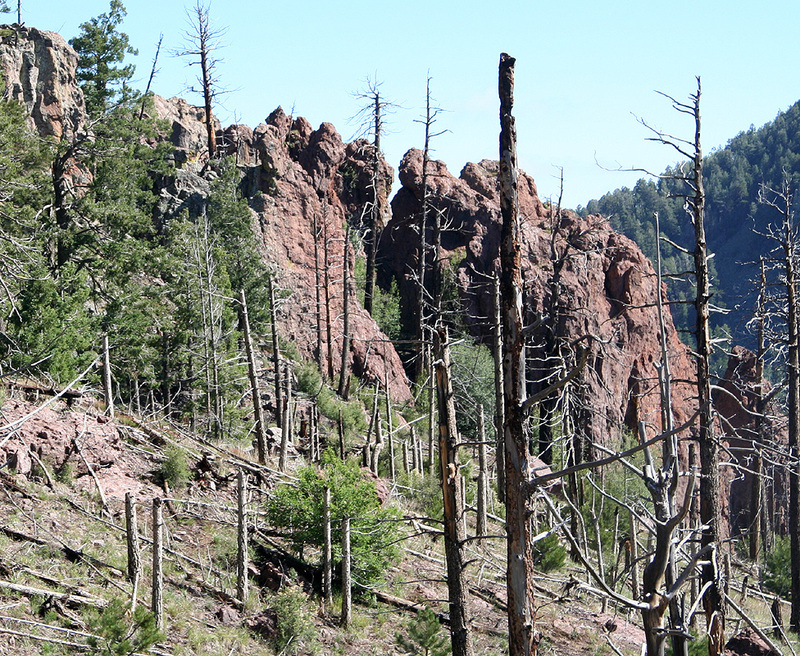 The route regains the main crest north of Raspberry Peak and follows the ridge to an interesting rock called Paint Rock, bypassing this on the right (west) side before descending slightly into the main saddle before Chiricahua. This saddle has elevation 2747 meter and is located at N31:50.301, W109:18.013. 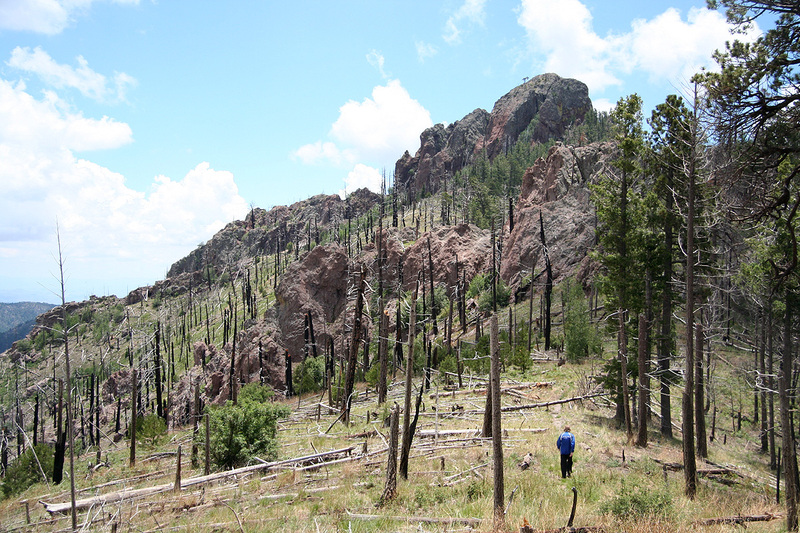 As you continue a gentle uphill towards Chiricahua, you will reach a trail fork. The right hand fork climbs the peak, but does not gain its summit. However, it is an easy walk (to the left) to gain the summit from this trail when the trail levels off before starting a gradual descent. 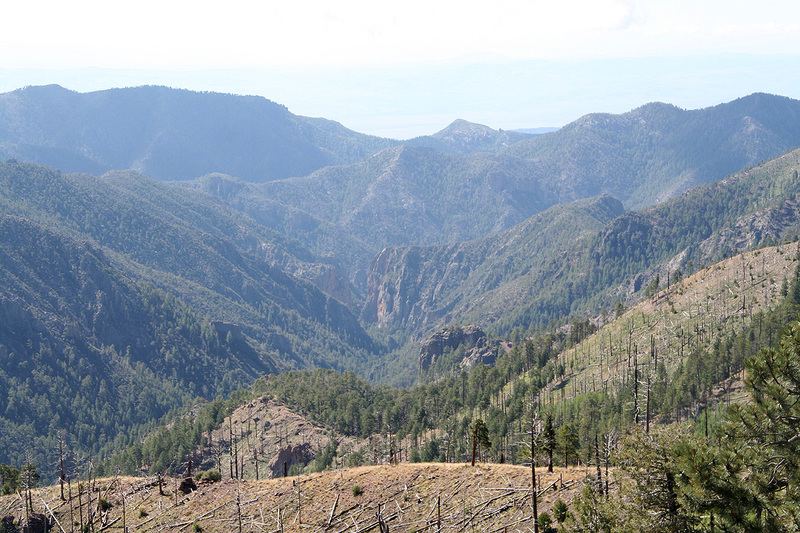 The left fork traverse to the north side of Chiricahua, slightly west, where there is another trail fork. From here, one trail traverses below the peak to its south-west side, while another trail actually climbs the peak to its summit area. 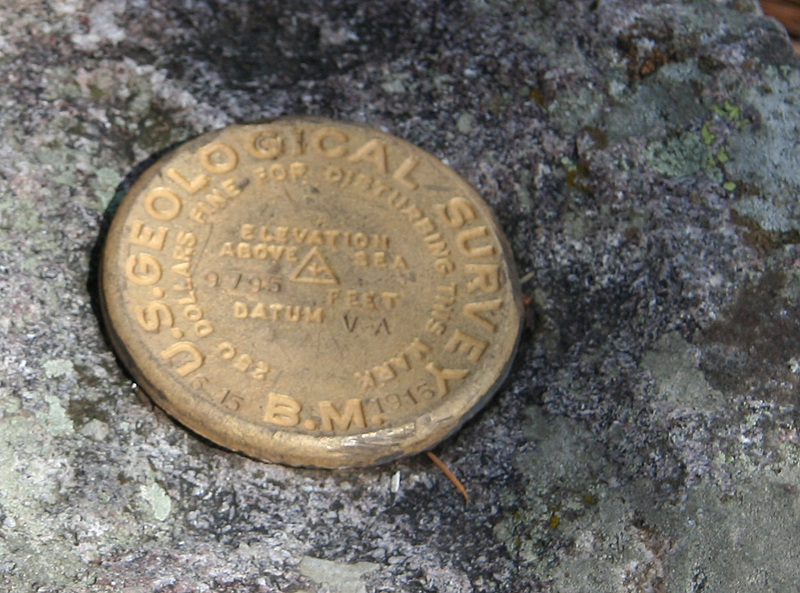 The summit area is fairly flat and has big trees growing on it, however, there is a single small rock with a USGS benchmark located right about the very highest point in the area. Comments: I did this hike with my son Pål Jørgen. We drove from Tucson, and were ready to start hiking at 0655. We reached the first col on the main crest after about one hour, continuing along the crest, we located the summit benchmark at 0955, 3 hours. This included a nice break right near the Painted Rock cliffs. We were slightly confused about the terrain, as we had no map of the area and had arrived via the trail that traverses below the summit on the south side. The USGS benchmark carried no name, but gave an elevation of 9795 feet, this is about 10 meter higher than what we believed to be the highest point in the range. Moreover, my GPS seemed to confirm this as it showed an elevation that was about 4 meter higher than this, possibly more in line with the more recent adjustments of elevations in the US. Thus, it seemed that no trail led to this summit, quite contrary to what I had read. We spotted the Snowshed peak to the south-west and it looked about equally high. Thus, we set out to also climb this peak, just in case we were on "the wrong peak". This effort required quite some time, arriving there at 1115. We quickly decided (from our GPS) that this peak in fact was lower. 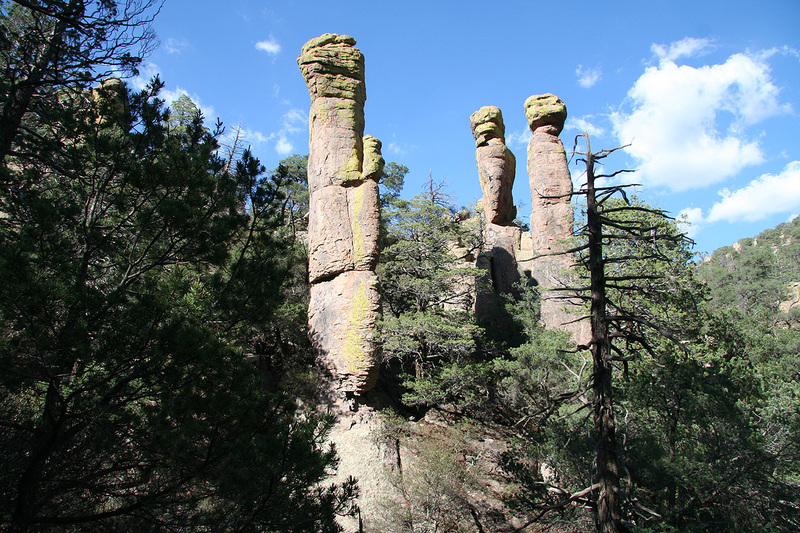 We now turned home, but hiked the trail on the north side of Chiricahua, thus exploring it in great detail. Here, we came upon the only sign in the area that actually says Chiricahua, thus confirming that we had indeed climbed the correct peak. 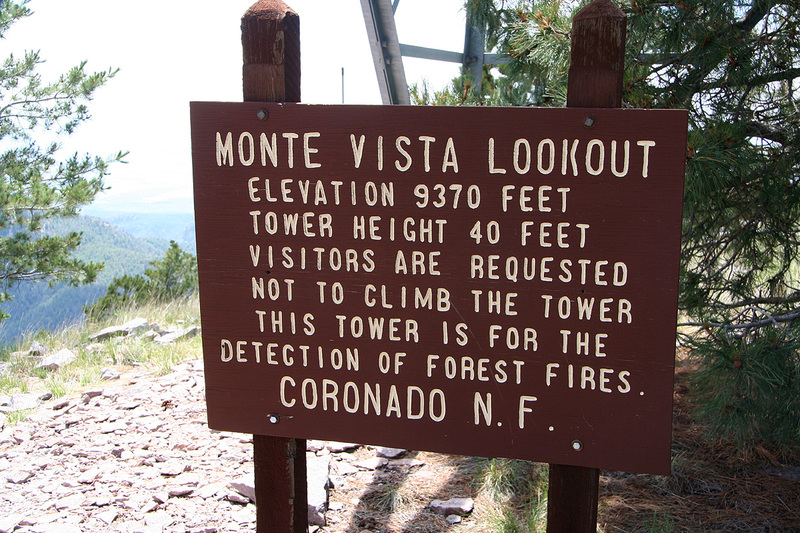 Going back, I also paid a visit to the Monte Vista top, there is a forest fire lookout tower (40 feet tall) as well as a cabin on the very summit. Returning to the car at 1440, this turned into a 7.5 hour hike, quite a bit longer than anticipated. 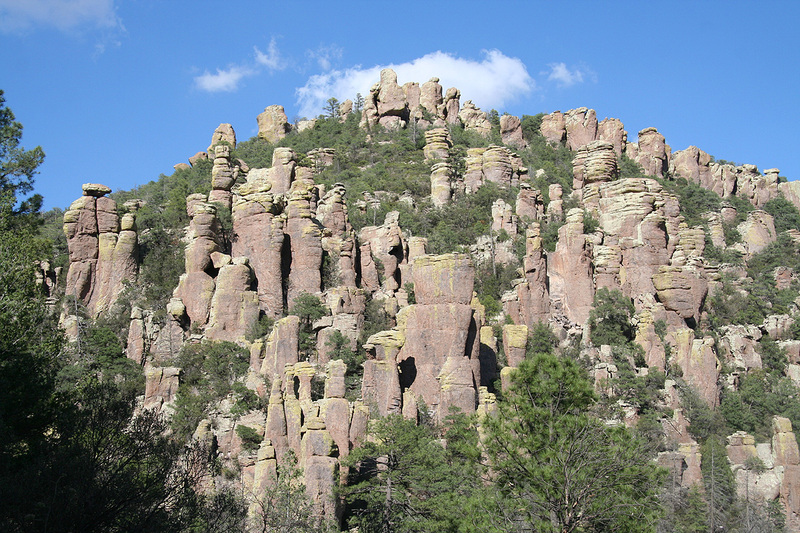 The next day, we visited the Chiricahua National Monument. 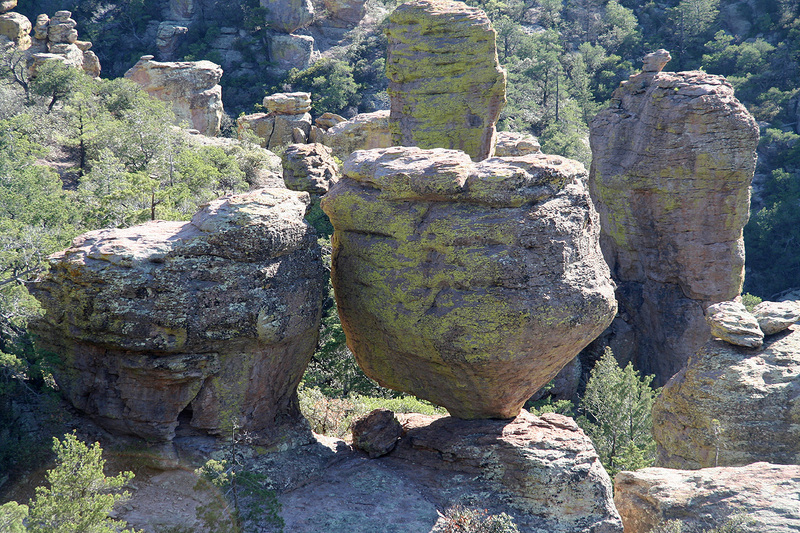 This is an interesting area with impressive rock formations. The local indians called this area "Standing up rocks". See below for more pictures. See this map for an overview of the route. 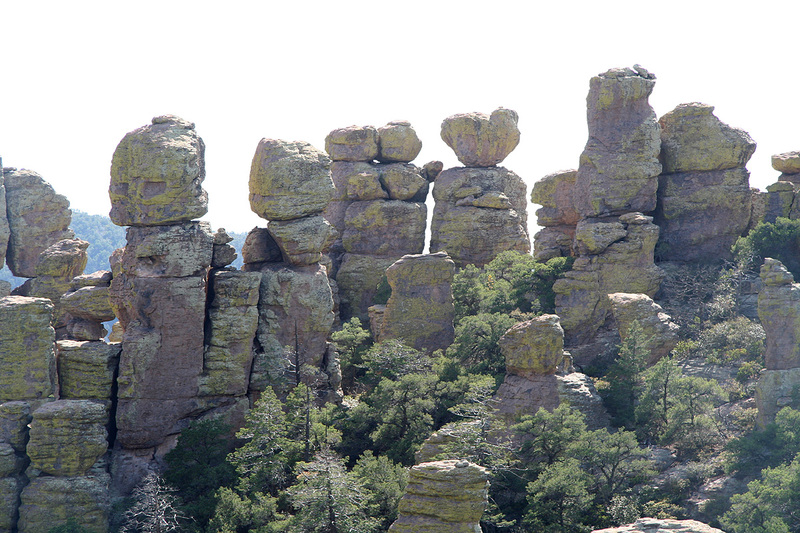 Chiricahua, (right) as seen from the main crest. Landscape, as seen from the main crest. The summit, a tree is clearly the highest point. 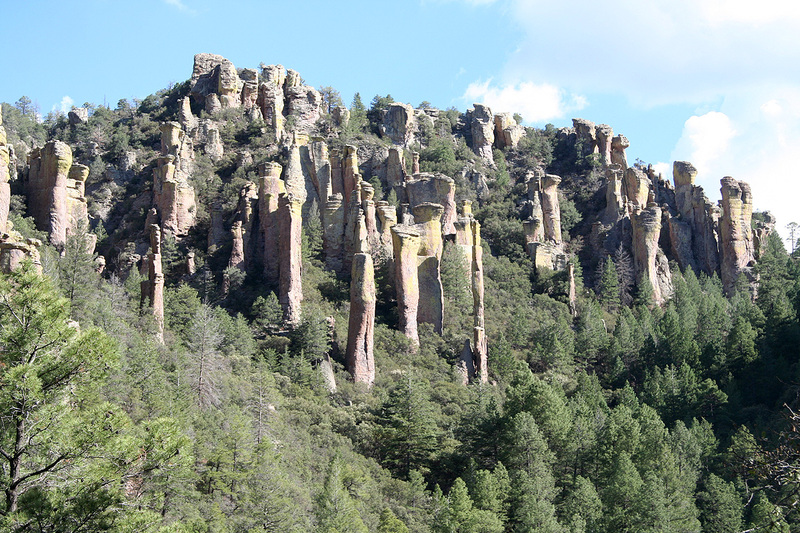 Chiricahua, as seen from Turkey Creek Road. The USGS BM, note that it shows an elevation of 9795 feet. Returning to Paint Rock, we are on our return hike. View from Monte Vista II. View from Monte Vista III. The sign on Monte Vista.